Looking for a fresh take on corporate events? Give your employees a new experience with an escape room challenge at your next corporate event! * Three Escape Rooms available (One Mobile Escape Room that can come to YOU!) * Bowling option available * Hall of Fame Lounge * Customized to suit your event’s schedule * Packages for every party and budget Food Menu Click Here Click below for our current group promotions for groups of 11 or more. Please contact us with any questions before purchasing. 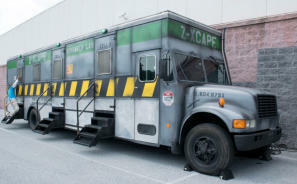 Corporate Team Building The Zombie Virus Mobile Escape Room can come to your office! No need to arrange everyone’s schedules for a team outing; you play an escape game right outside your front door. Employees must take advantage of their surroundings, use their wits, and work together in order to escape the Zombie Virus! We work with you to schedule groups beforehand, and each group can compete against each other to see which gets out the fastest! Please contact us below to prepare a custom quote for your event or call us at 717-260-5460 if you have any questions. Looking for a fresh take on corporate events? Give your employees a new experience with an escape room challenge at your next corporate event! * Three Escape Rooms available (One Mobile Escape Room that can come to YOU!) 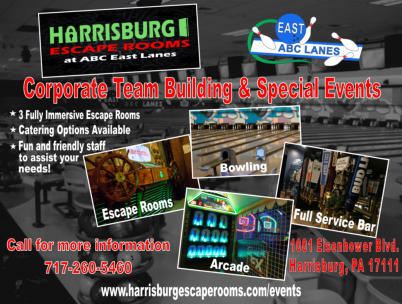 * Bowling option available * Hall of Fame Lounge * Customized to suit your event’s schedule * Packages for every party and budget Catering Menu Click Here Click below for our current group promotions for groups of 11 or more. Please contact us with any questions before purchasing. Please contact us to prepare a custom quote for your event.